A proposal intended to curb costly trap wars would require Maine lobstermen to put two tags on traps they set outside their licensed fishing territory. Right now, every trap that is set along Maine’s 3,500-mile coast must have at least one tag, which identifies the fisherman who owns it. That 50-cent tag is the primary enforcement tool the Maine Marine Patrol uses to make sure a lobsterman is hauling only his or her own traps. Limits on how many traps lobstermen can drop outside their zone are hard to enforce with only one tag on each trap, marine patrol officials say. Under state rules, Maine lobstermen can set up to 49 percent of their traps outside of their home fishing zone. 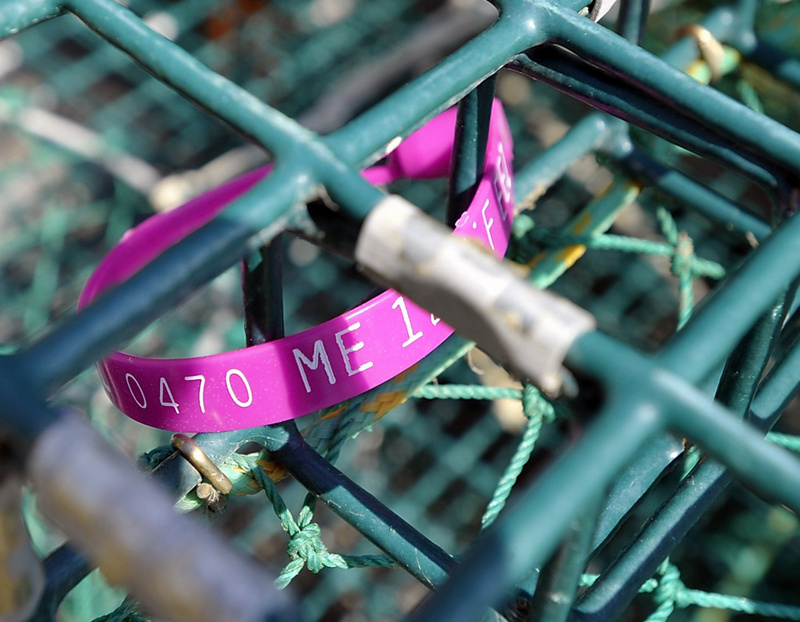 In two zones along the coast, where fishermen are competing hardest for prime ocean bottom, lobstermen are already required to put second tags on traps dropped outside their home zone. Now, the Maine Department of Marine Resources wants to extend double-tagging to all seven lobster zones to make it easier to catch lobstermen who are fishing too many traps outside their zone. That’s because without a second tag requirement, the marine patrol would have to haul more than 392 traps in one day to prove a fisherman with the maximum 800 allowable traps had broken the so-called 49/51 rule, said Cloutier. The agency has done just that, Cloutier said, but it takes a lot of time and manpower – two or three officers on two or three boats – and fishermen know that. With the second tag, a patrol officer only has to check a handful of lines, and if the traps are properly tagged, it’s a strong indication that the lobsterman is complying with regulations. The marine patrol couldn’t provide specific statistics on out-of-zone fishing violations, but Cloutier said it has become more of a problem in recent years, as the state’s lobster fleet follows the lobsters east. Fishing has generally been better to the east, Cloutier said, especially over the fall and winter. While landings are up across most of the state, the biggest increases have been in the east. Regulators know double-tagging won’t solve all their problems. The state adopted the rule in zones B and C in 2010 after a rise in complaints there. The dividing line between those two zones, between Swans Island and Stonington, is at the heart of a “tremendous” trap war now, Cloutier said. The marine patrol says the clash has resulted in the loss of more than $350,000 worth of gear as lobstermen cut the lines of others they believe are setting too many traps outside their home zone. Marine patrol checks have found these complaints to be unfounded, however, with all but a handful of out-of-zone traps outfitted with two tags, Cloutier said. That enforcement tool has not stopped the feud, because lobstermen refuse to believe their rivals aren’t somehow gaming the second-tag system, he said. But it would have probably gotten much worse if the agency couldn’t check for second tags easily. The department held a series of hearings on the double-tagging proposal this fall, and only a few people raised concerns about the rule, said Deirdre Gilbert, Department of Mariner Resources’ director of state marine policy. Most who attended the hearings supported the concept, she said, and most of the questions focused on how much time lobstermen would have to add second tags to out-of-zone pots. John Drouin of Cutler, chairman of the lobster council that oversees fishing from the Canadian Maritimes to Schoodic Point, has fished Down East waters for 37 years. He said double-tagging would be a nuisance for law-abiding fishermen, but he still thinks it’s a good way to prevent people from ignoring the zone boundaries and preventing costly trap wars. If double-tagging is approved by the Department of Marine Resources Advisory Council, and made into regulation, the Maine Marine Patrol would gradually phase in its enforcement, spending a lot of time in the first few months educating lobstermen about the new rule, Cloutier said. But any evidence of intentionally fishing too many traps out of a home zone would still lead to consequences, ranging from a warning to a fine to a license suspension or revocation, he said. Some lobstermen don’t like the idea of double-tagging, especially the additional cost and the burden of trying to keep track of which hauled traps have the second tags on them. Plus, the tags can come apart and fall off the traps when picked or set in rough water. One lobsterman who double-tags said he can count on finding a pile of broken tags on his boat deck at the end of a busy fall day. Richard Whitman of Rockland doesn’t think double-tagging is needed in every zone. He chafes at the extra cost, which is just one more government regulation to eat into his profits. Whitman said it’s not even clear if double-tagging will deter people who are determined to skirt state rules, or if it will simply be a hassle, and an expense, for those who already comply with regulations. To address the cost concern, the Department of Marine Resources is dropping the cost of second tags to 10 cents each, which is what it costs the department to buy and administer them. For a lobsterman who straddles a management zone border, and sets the maximum 800 traps, a second-tag rule would cost another $40 a year, as compared to the $400 spent on primary trap tags.